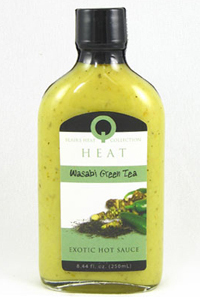 This Wasabi Ginger Sauce is great on Asian food and wonderful when mixed in with your favorite salad dressing. Made with Jalapeno Chiles, Japenes Horseradish, Ginger, Spices, and other goodies, it is hard to go wrong with this new Blair Creation!!! As others have noted, it's not hot. It has a really good flavor, and tastes great with grilled seafood, such as salmon. LIKE ALL THE HOT SAUCE. with the title "Heat," I expected to get some heat. This sauce had none. I'm not even a person looking for the hottest sauce around, but give me something! Very disappointed. Has potential to be a great sauce.